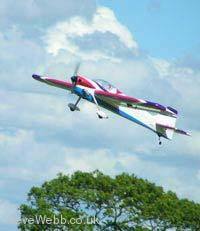 A scale aerobatic model airplane for the experianced pilot. 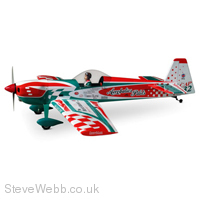 The stunning colour scheme is sure to be the talk of your model flying club. It is very similar to the Castrol Cap! except in no longer has the wording - the colour scheme remains very similar. This is the LATEST version. Recently updated, this kit is probably one of the best Cap models on the market today. Top quality balsa and plywood construction and covered with genuine heat shrink World Models ToughLon covering. Hand painted fiberglass cowling with 3D clear template. Comes with all hardware and accessories to complete the airframe. Spares are available including the Pre printed heat shrink covering! Wing Span : 56.5 in / 1440 mm . Wing Area : 469 sq in / 32 sq dm . Fuselage Length : 50 in / 1270 mm . Engine Required : 2 stroke 0.46 . 4 stroke 0.70 .